One of Jon’s favourite cakes is carrot cake and he’s been nagging me for ages to make a carrot cake to share on here.I’m happy to say that I’ve finally mastered a carrot cake that we absolutely love (well it’s actually cupcakes as recipe testing is far easier for little cakes). 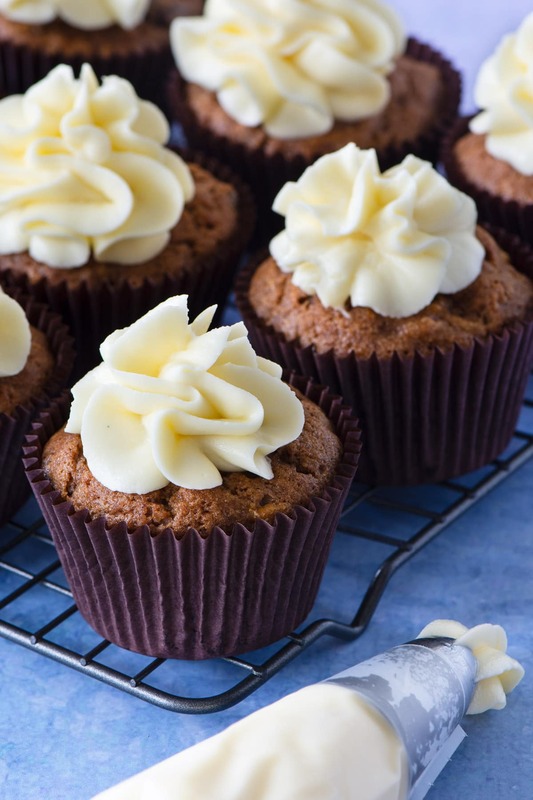 Before I get to the recipe for the cake (I promise I’ll share it very soon), I thought I’d share my recipe for delicious, smooth cream cheese buttercream. It’s the perfect match for my fruity carrot cake or a red velvet cake. This cream cheese buttercream is perfect for piping as it has a lovely smooth texture. In the recipe, I’ve mentioned using a splash of milk if the buttercream is a little firm, but generally, I find this isn’t needed.One thing to note is that this is a soft buttercream and it doesn’t crust like some other buttercream recipes. That means it’s better for popping on cupcakes or decorating a simple layer cake, rather than for elaborate decorations or putting under fondant. This also means that it freezes brilliantly and it just as perfect for piping after it’s defrosted than on the day it was made. I’ve also tried freezing the cupcakes after they’ve been decorated and this also works well. Cut the butter (125g) into cubes and beat (either by hand or using a mixer on a slow speed ) until soft. Sift the icing sugar (125g) and beat it into the butter until fully combined and smooth. Add the cream cheese (250g) and vanilla extract (¼ tsp) and beat until thoroughly combined and smooth. Check the consistency of your buttercream. It should be firm, but soft enough to pipe. If it is too firm, then beat in a little milk (no more than a teaspoon at a time) until you have the right consistency. Your buttercream is now ready to use. This recipe makes enough buttercream to decorate 12 cupcakes in the way shown in the pictures. If you would like to pipe a buttercream rose (like these) then this recipe will be enough to pipe 14 cupcakes. If you would like to pipe a taller swirl (like these) then this recipe will be enough for 9 cupcakes. 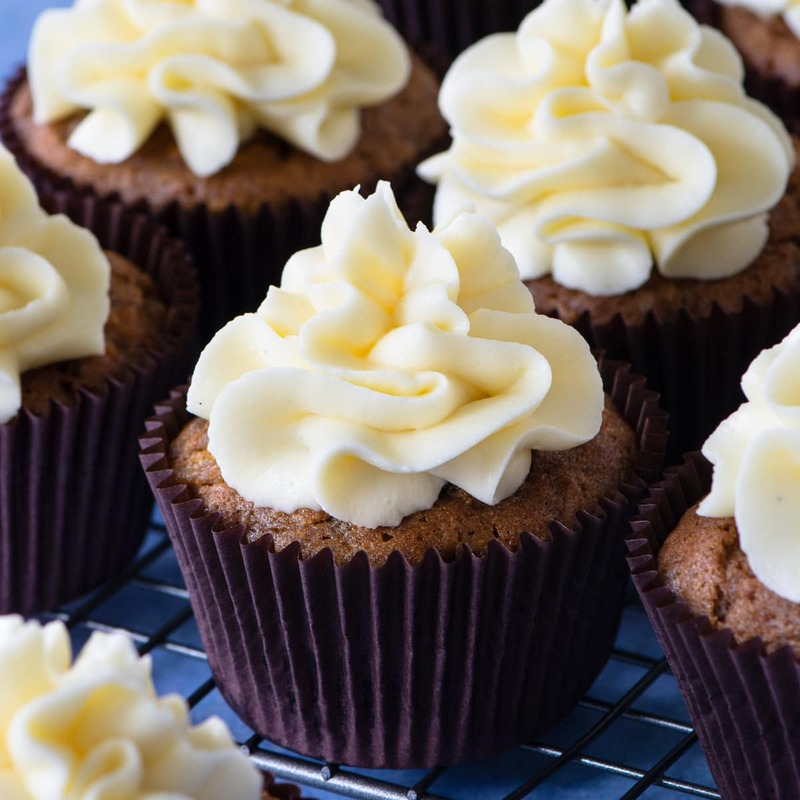 You may find you have a small amount of buttercream leftover after piping as it's easier to pipe neatly if you have a little more than you need. For best results, I recommend using the metric measurements rather than US cups as measurement will be more accurate. For more information about the US cups conversions please take a look at my interactive calculator. Can you freeze cream cheese buttercream? Absolutely yes! 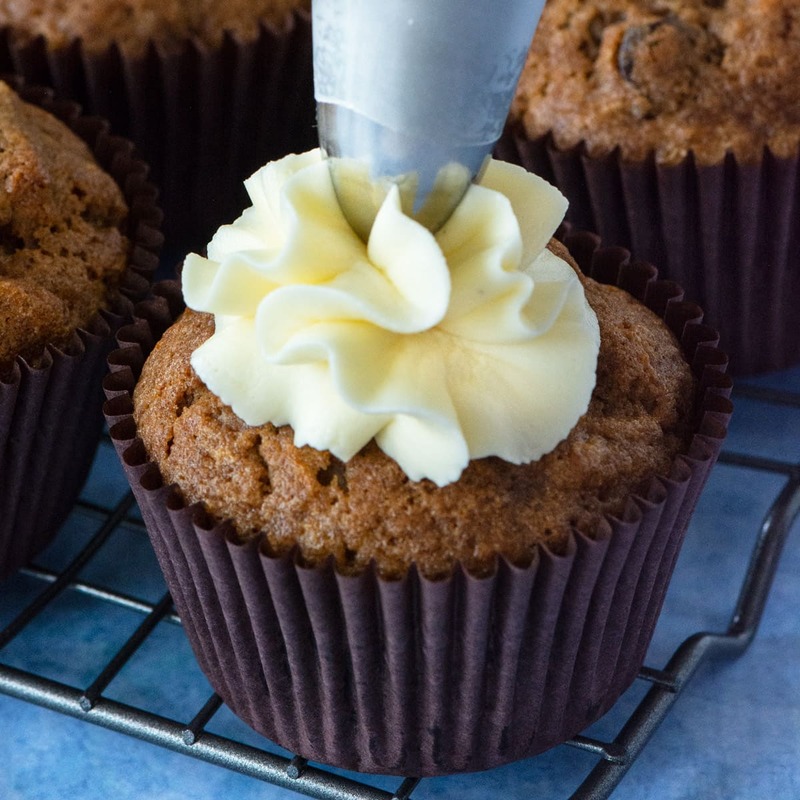 This buttercream freezes extremely well and once defrosted is as smooth and perfect for piping as when it was first made. 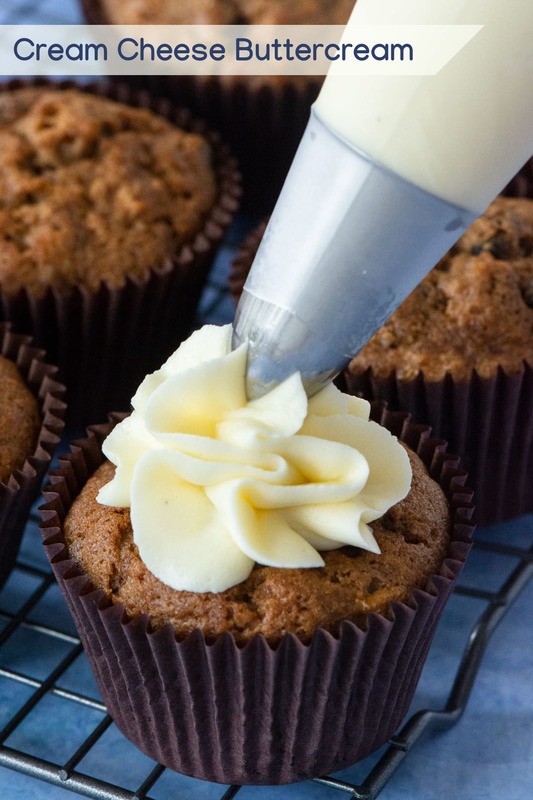 To freeze the buttercream, simply put it into an airtight bag and pop it into the freezer. Allow it to defrost thoroughly in the fridge before using. It should be fine in the freezer for up to three months. I just used this on the cupcakes I made for my son’s birthday. Best frosting I’ve ever tasted. I’m never buying the premade stuff from the store ever again! Great recipe! I am making red velvet cupcakes this weekend, now I have found the perfect frosting recipe. Does the cupcakes need to be kept in the fridge or can they be kept at room temperature? As the buttercream contains both butter and cream cheese I would store it in the fridge. Could you note whether it is salted or unsalted butter. This eternal question in recipes always leaves me scratching my head. It looks to have a beautiful texture! I bet it’s perfect on carrot cake cupcakes.